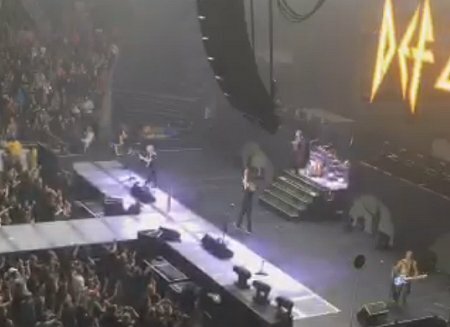 Def Leppard played a 2016 Summer Tour show last night in Toledo, OH with 17 songs performed. The show took place at the 8,000 capacity Huntington Center. The band's first time in Toledo since 23rd August 1992 on the Adrenalize tour. The sixth show the band have played in Toledo and first time at this venue which opened in October 2009. The first visit to Toledo was in September 1981 on the High 'n' Dry tour with Blackfoot at the Toledo Sports Arena. They returned as headliners to the same venue in July 1983 on the Pyromania tour with Krokus and Gary Moore in support. An In The Round show was played at the arena in September 1988 on the Hysteria tour when they were supported by Queensryche. Toledo Sports Arena was demolished in 2007. Two consecutive In The Round shows were played in Toledo in August 1992 at John F. Savage Hall which is part of the University Of Toledo. The shows played over the 22nd/23rd August were the last time the band would play Toledo until last night. Ending a wait of 24 years for local fans. No changes were made to the regular 17 song setlist. Phil Collen played with Tesla again on 'Save That Goodness'. "Thank you. Thank you very much. Let's have another little look. Oh look at this. That's beautiful. It really is a pleasure to be here with all these people making all this noise. Making all this noise. Good to be here. Look who's here. (To Rick) No, later. No this boy here. This boy here ran away from home 35 years ago this year. All the way from his home country of Northern Ireland to the rock and roll capital of the world, wherever that is. But he joined the rock and roll circus and he is the boy who puts the fast in Belfast. Ladies and gentleman can you make a lot of noise please. I said can you make a lot of noise please. 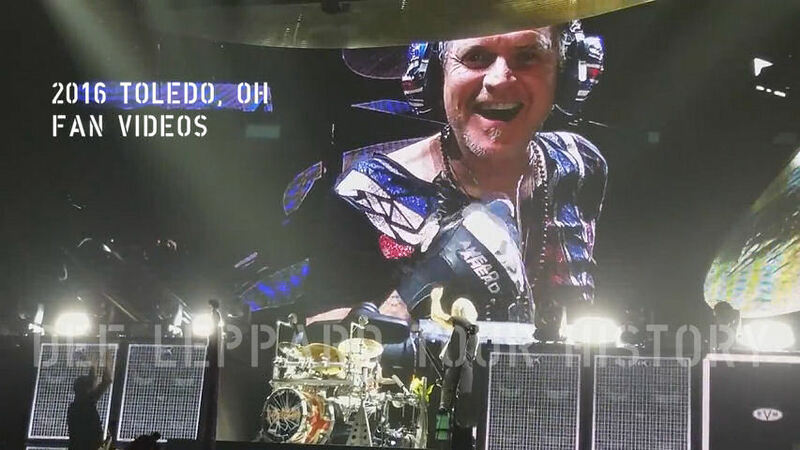 For a very happy and healthy Vivian Campbell!." "Thank you. Thank you very much. Wow as I said earlier this is the second to last show of our 2016 tour. What a great way for this to come to an end. One more left but look at this for a Saturday night. Here we are. Toledo, Ohio. Amazing. Thank you very much. Can you show a little bit of love please for Tesla who started everything off this evening. And REO Speedwagon who drive it on. As it were." "(to Rick after drum beat) Ha Ha. What are you doing?. And a little bit of love for this boy at the back here. Stand up Rick Allen!. And as always he will introduce this one for ya." "Toledo, Ohio!. Thanks for having us, thanks for coming, thanks for being here. Goodnight." The next show takes place on 10th October in Cedar Rapids, IA. Played for the first time in Toledo. Played for the first time in Toledo as the Single Version.